I’m continually being asked the best way to do patient testimonial videos, so I’m going to lay it out for you. People ask in part because I am always saying that patient videos are the most powerful marketing tools available, and perhaps the most versatile. You can post them on your website, on your YouTube channel, on Facebook, and in your Google and Yelp profiles. And people love watching videos. Facebook and Snapchat both have over 8 billion video views a day. Yes, I said billion! Requesting and making videos should be someone’s specific responsibility in the office, and in some ways everyone’s. Every team member should be willing to request this from a patient they believe will do a good testimonial. But every office should have one point person–the Facebook Geek, I call them–that is in charge of regularly doing these, like one a week, and then posting them in all the appropriate places. Identify a patient who might be a good candidate, either because they just had a great result, or they’ve already praised the practice in some way. If they just said, “You are all so nice here. I’m so happy I found you.” That’s your cue to say, “We’d love it if you would do a short video saying that for us to use on social media. You know how important that is nowadays.” Don’t say crazy stuff like, “Please help us promote our practice,” or, “We really need your help getting new patients.” Don’t sound desperate. If the person is reluctant, just say, “If you don’t like it we won’t use it. But all you have to do is take 30 seconds and tell us what it’s like to be a patient of ours.” If they’re still hesitant, then back off. This is what makes the testimonial real and credible: You didn’t make a big production out of it. You made it like a video that they do themselves all the time. Using a smartphone camera is also less intimidating to the patient. One more important thing: shoot it in horizontal mode [I’m amending this from my original post] because in most media it will look much better. The one challenge is that 70% of Facebook viewers are watching on mobile phones, and people don’t like to turn them. This is why Facebook’s new Canvas ad format is a good example of the direction this is all going. The solution is to shoot through Instagram in horizontal mode, and then you can modify the shape if you want to. the practice/dentist’s name–this “labels” the video internally. WARNING: Don’t let them talk about their treatment in the video! This qualifies as “patient health information,” and this is where the HIPAA challenge arises. It would require you to create a release from the patient describing the specific treatment and who the audience would be that would see it. Too much trouble. The fact that they agreed to make the video would seem to me to qualify as a release, but the government doesn’t see it that way. However, the patient can make a video on their own phone and post it to their Facebook wall. Patients can say whatever they want in their own posts on social media, because they can’t violate their own HIPAA. If they do it that way, then you can share that video on your practice page. If you did more than one take, ask them which one they like. But make sure they approve you using it. If you don’t already have one with the patient, get one, to use their image and video in all media, including social media, in perpetuity. If they won’t sign one, then don’t use the video. If you have an account with HR for Health, they can provide one, otherwise use LegalZoom. If they did it on their phone, obviously they can share it on Instagram or Facebook. As a huge motivational bonus, show them to your team in morning huddles. Letting everyone know how much they are appreciated by patients is a great way to start the day. The above one mentions the treatment, cost, negative aspects of the experience, but is in the right framing–horizontal. This one doesn’t mention treatment, is positive and energetic, and says the dentist’s name. But it’s shot vertically, so it’s only good for Facebook mobile. Almost there. Make it a habit to do videos. 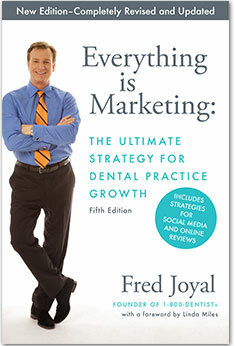 As I said, they are the most credible and versatile marketing tool you have or your practice. Do one today!